A perennial is a plant that lives longer that two years. Many smaller flowering perennials bloom over spring and summer then die back in Autumn and winter. In warmer climates perennials tend to grow continuously whereas in seasonal climates they grow only in the warmer seasons. Aussie Winners has a superb range of perennials that are specially suited to patios, hanging baskets and gardens - large and small. 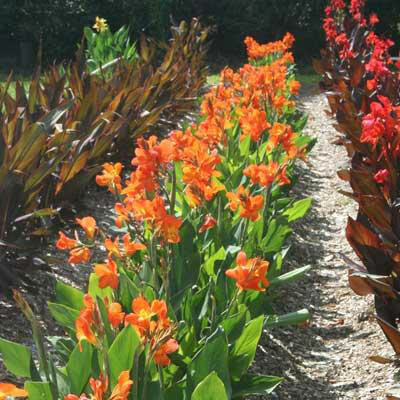 Once established most need very little attention and plants such as the Canna ‘Show Offs’ can transform your setting with vivid colour and foliage. 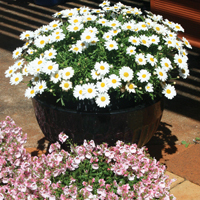 As well, many perennials make excellent border plants such as Aussie Winners Leucanthemum ‘Daisy May’. Many perennials benefit from dividing in early spring or autumn to allow for more plant growth and to keep the plant thriving. Aussie Winners perennials are bred for an extended and healthy life with good flowering periods which makes them fantastic for all garden situations.